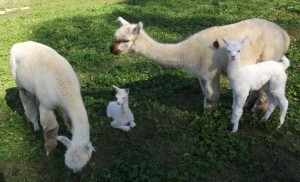 Electric Snow gave birth to her first cria (baby alpaca, pronounced cree-ah) on October 18, 2011. He is a sweet white boy named Timbuctoo. Timbuctoo, “Buck” weighed 14.8 pounds at birth, smaller than our crias typically have been, but within the average alpaca cria weight of 14-20 pounds. 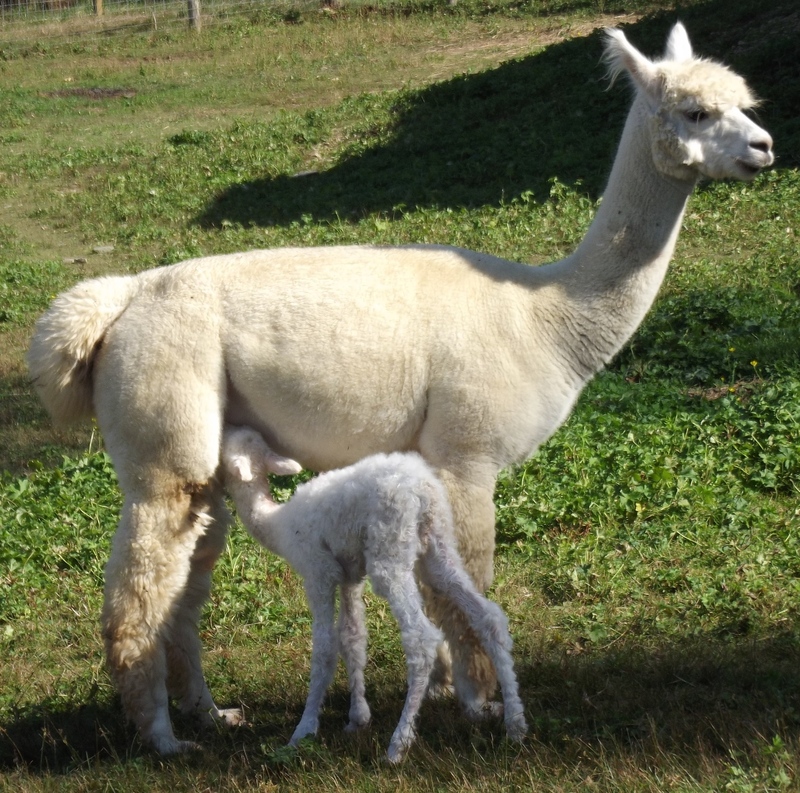 He was nursing regularly throughout the day, and moving all around the pasture with mom Snow. Our other fall alpaca crias and mamas were all excited to come over and check out Timbuctoo as he started to get to his feet and move around. Our newest little girl Angelica and her mom Ima Joy were particularly interested in Buck and spent a lot of time close to Snow and Buck during the first day. Timbuctoo’s sire is our Reserve Color Champion Lord Tennyson. Like his brothers Becket and Milton, Timbuctoo gets his name from one of the works of our Tennyson’s namesake, the poet Alfred, Lord Tennyson. 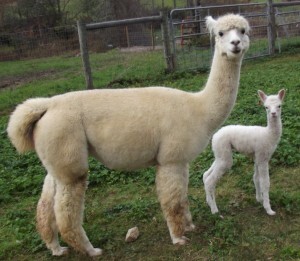 Timbuctoo is our fourth white alpaca born this fall, and 7th male cria out of 9 born in 2011. Angelica is hoping for another girl among the last two due this year. Hopefully she’ll have a girl playmate soon, but all the crias are having fun playing together. 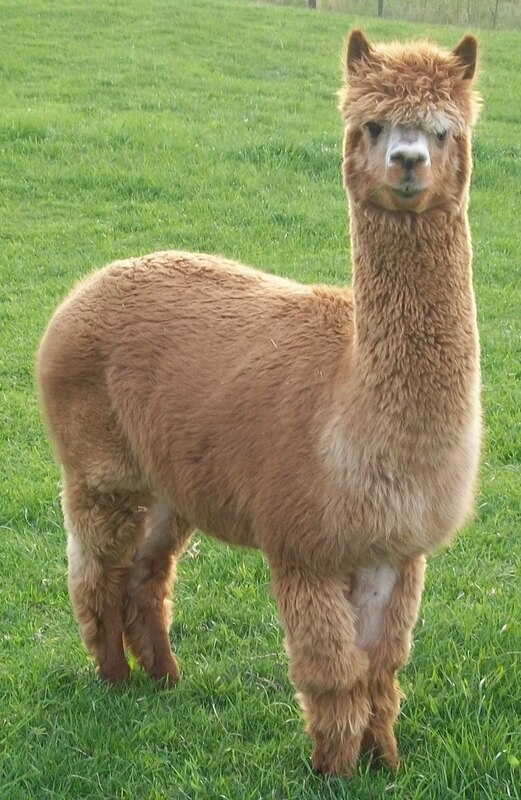 Our first fall cria Lightning Bolt is King of the Pasture, and Angelica is the Princess. Come by and see them and their pasture buddies. We hope to have our last two 2011 alpaca crias join them soon. Our beautiful alpaca Ima Joy gave birth this morning to her second cria, a lovely little girl named Angelica. 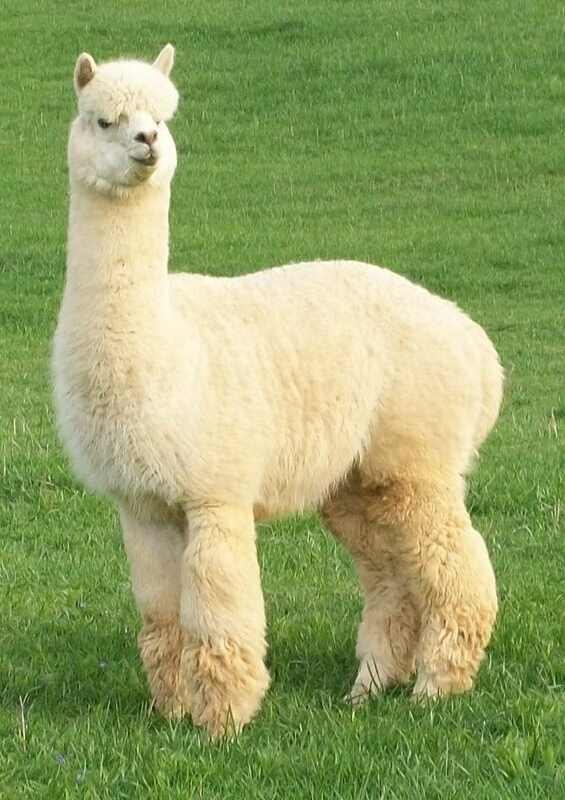 Angelica has an incredibly soft and fluffy white fleece. We looked to see if she inherited any of her mother’s lovely spots, and she has, one fawn spot above her front left knee. Her tail also looks like it is light fawn. Her blanket fleece, though, is pure white. Angelica weighed 16 pounds at birth. She is a strong girl, who was up and nursing right away. Our other fall crias, Lightning Bolt and Sunspot, wanted to start playing with Angelica before she was even up and steady on her feet. By the end of the day, she was running with the boys. Sunday was a busy day at the farm, so there were a lot of people here to witness Angelica’s birth and her first few hours learning to stand and run around the pasture. Kris Webb shared the lovely picture of Ima Joy and Angelica soon after she was born on our Facebook page. It reminds me of a picture we took of Ima Joy and her mother Natasha right after Ima was born in 2007. 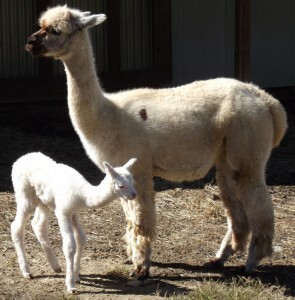 Ima Joy was the fifth alpaca born on our farm; Angelica is the 37th. We get just as excited now with each birth as we did when we started. 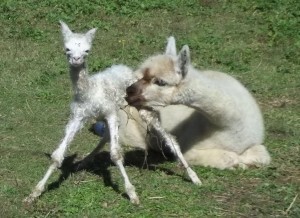 Angelica is the second cria we have had this year from our herdsire Snowmass Casanova’s Arch Angel. She and her brother Gabriel are both beautiful, and we can’t wait to see our last Angel cria of the year later this month. We hope you can come by to see Angelica and her pasture buddies at the farm. If you aren’t going to be up this way, you can see pictures of all the crias on our Facebook page, which we update regularly. We have several opportunities coming up for those who have been wanting to take a class all year. Now is the time to sign up! It’s a perfect time for learning something new and making a great gift or something fabulous for you. All of our classes require no previous fiber art experience and are great fun. You can see pictures from many of our previous classes on our Facebook page. Our Fun with Felt series has been such a success, we couldn’t wait to schedule another class with felt artist Karen Simpson. We have added three more classes before the end of the year. By rubbing dyed wool and undyed alpaca fiber with warm, soapy water, we will create one-of-a-kind wearable art for you or gifts. No knitting or crochet is involved, and no fiber art experience is required. We will be felting a one of a kind hat on November 20. 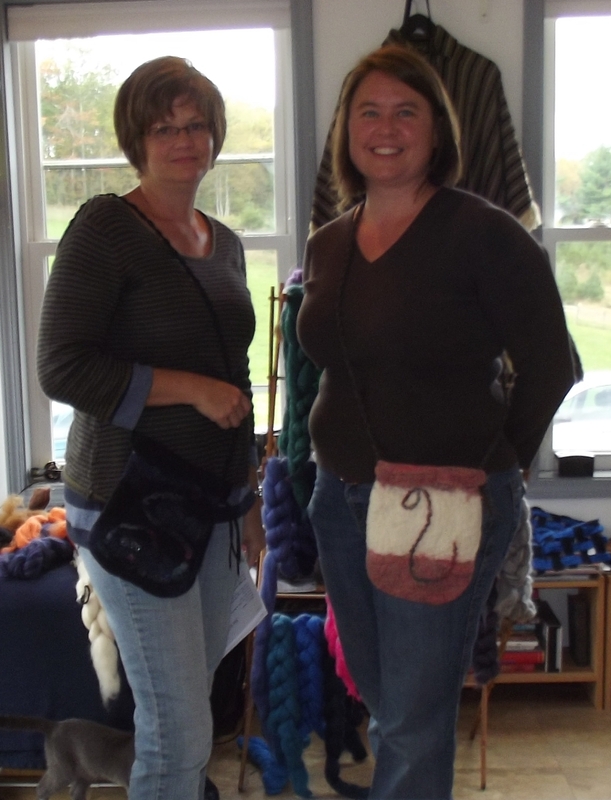 On December 17, we will be offering the popular felted purse and scarf classes again. We hope you can join us for one or more of these fun classes. Register today online or by phone. The class sizes are limited, and you must sign up by November 1 for the felted hat class and December 1 for the felted purse and scarf classes. We also have a couple more classes this year on the Knitting Loom: Nov 12 or Dec 18 from 2-4 pm. 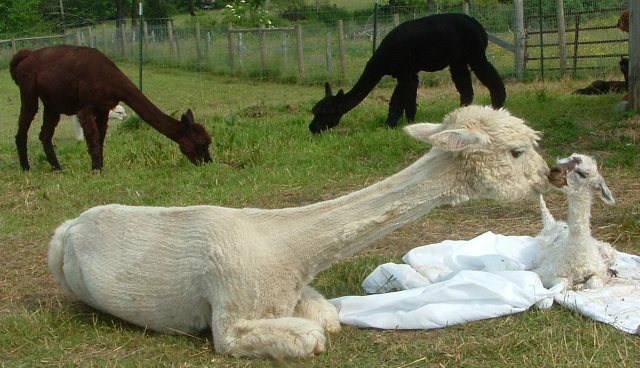 During this fun and easy class, we will learn how to create an alpaca scarf using a knitting loom. Our Triangle Shawl Weaving class is now full, but we will be offering it again next year. 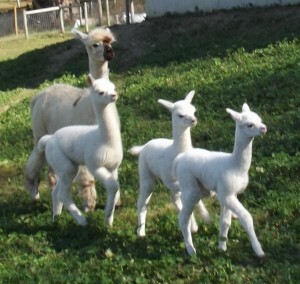 You can keep up with our Fiber Art Classes and other Peaceful Heart Alpacas farm news through our email newsletter. We will be sending out notices as soon as we schedule our 2012 classes. 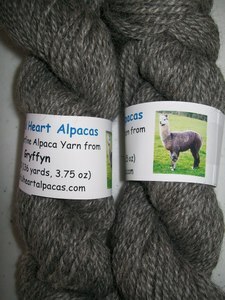 The first of our 2011 alpaca yarns have arrived! 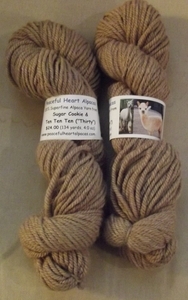 The white, fawn and gray yarns are now in stock, and I must say they are our best yarns ever. All of these, Virginia grown, Tennessee spun (at a small fiber mill), 100% undyed, alpaca yarns have been spun in a 3 ply worsted weight and have an incredible feel. 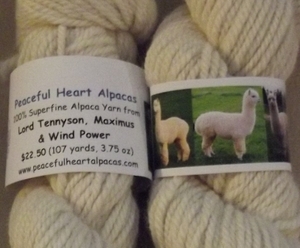 You can see these beautiful alpaca yarns at the farm or in our online store. Have fun knitting, crocheting and weaving. I think you’ll love them. Our 2011 dark alpaca yarns will be arriving soon. 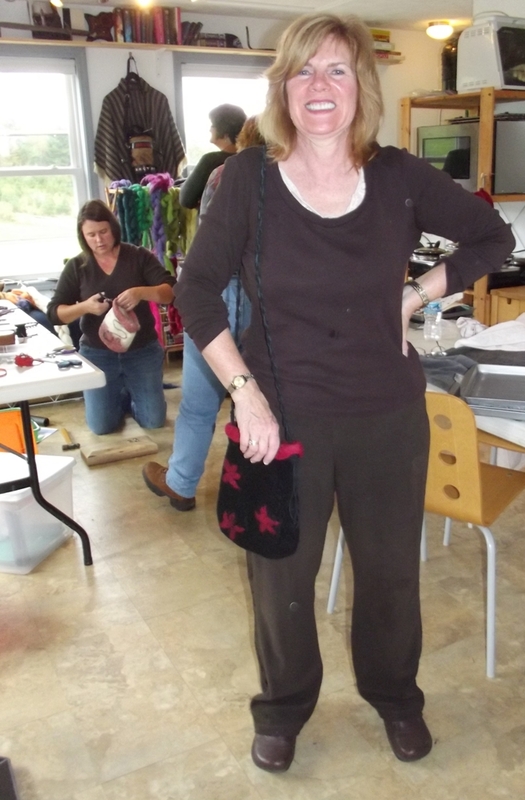 We had a wonderful wet felted class today (October 1) creating one of a kind felted purses. Everyone is so creative in their designs, and the classes are always fun. Karen Simpson is a great teacher and we always enjoy her classes. The felted purse class is one of our most popular, so we will be offering it again one more time before the year is out. 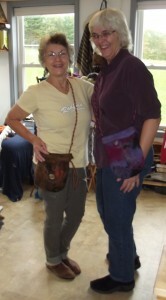 Click here to learn about our December 17 wet felted purse class. We will also be offering a felted scarf class that same day in the afternoon. For those who have been wanting to take our felted hat class, we are offering it again on November 20. You can see pictures from today’s purse class on our Facebook page and see the process we go through to create these great purses. You can also see the pictures from our previous wet felting classes on Facebook.